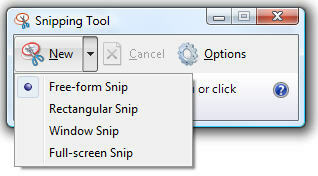 Microsoft Windows Vista comes with a built in application called Snipping Tool to capture screens. The Snipping Tool allows you to capture a screen shot of any object on your screen and then annotate, save, or share the image through e-mails. The application can be launched by selecting Start Menu-->All Programs-->Accessories-->Snipping Tool. User interface of the application is very simple and elegant with handy options to capture different display areas of the screen easily. You can use a mouse or tablet pen to capture full screen, window, required rectangular section or even a custom shape. After you capture the image it is automatically copied to an edit window where you can annotate, save or share the image. The edit windows provides Highlighter and Pen options to highlight an area and to write on or around the image. This application has a decent functionality which helps small bloggers and technical document writers to capture simple screen shots with out spending money for purchasing third party applications like SnapIt and FastStone Capture.